Tucson’s Community Food Bank is harvesting the power of the sun to serve more members of our community. The food bank’s 68.80 kW solar electric system will save the non-profit organization nearly $10,000 per year. The electricity savings alone will help pay for about 1,000 emergency food boxes annually, which help to feed local families. Currently, the food bank is providing meals to nearly a quarter of a million people in Southern Arizona. 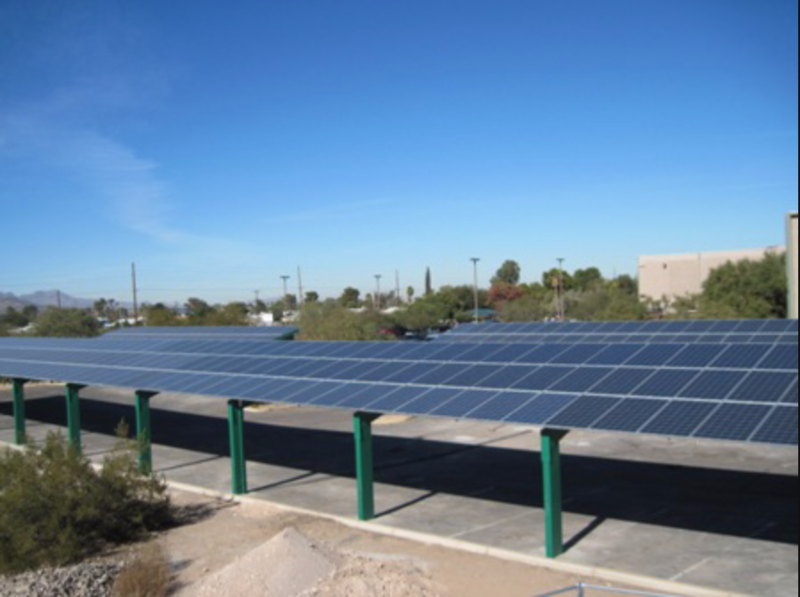 The food bank's photovoltaic system (AKA: solar electric system), which consists of 306 solar panels, was incorporated into a solar parking shade structure, and is located south of the non-profit's main building. The funding for the Solar Project came through the efforts of Congresswoman Gabrielle Giffords in the form of a $200 thousand federal grant from the Department of Housing and Urban Development (HUD) with Economic Development Initiative Funds (EDI). The project also includes funding from Tucson Electric Power’s Up-Front Incentive Program. This generous funding covered more than half of the cost of the project. Food bank officials are hoping that another federal grant will allow them to put up a second solar array in 2011.